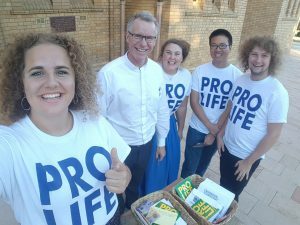 HIGHLY VISIBLE in their ‘loud’ shirts, this year’s Crossroads Pro-Life walkers represent a growing number of young people ready and willing to take a stand for life. The 2018 Crossroads group of 10 left their mark in Canberra last month en-route to Melbourne, having begun in Brisbane. It is the sixth year in-a-row that the annual pilgrimage has taken place. O’Connor Parish Priest, Fr Paul Nulley, joined the Crossroads crew for their 2014 pilgrimage. Ranging between 18 to 30 years in age, each of this year’s 10 members, spoke at parish Masses during their Canberra visit. Group spokesperson, Benedict Slee, a 24 year old recent graduate from Sydney’s Campion College, said the message and witness they bring is a vital one. “We are trying to help build a true Culture of Life in Australia,” he said. Mr Slee, said there are many ways to help build the Culture of Life be it helping out at a pregnancy support centre, offering to babysit, helping a mother in need, volunteering some time for others, or simply offering some extra prayers and sacrifices this Lent for an end to abortion. “These are things which many people, especially the young, can do,” he said.